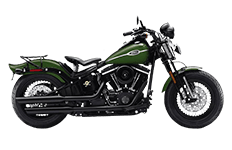 Although its inception came within more recent years of Harley Davidson's storied history, the Softail Cross Bones bike is a tried and true thoroughbred. Riders understand this bike is an instant classic, therefore only the most sophisticated luggage accessories matter. We feature this full lineup of Viking Bags designed specifically for use with the Softail Cross Bones, complimenting the bikes in every way imaginable. Available in a variety of sizes and shapes, it doesn't matter what kind of saddlebag you prefer; we've got you covered.